From a small web design company to one of the best experienced, dedicated businesses in Utah. Infogenix began in 1998 as a small basement web design company located in Provo, Utah with one goal: dedication to our clients. We now have over 15 years of experience working hard to make our clients' ideas into digital reality that looks great and works seamlessly. Our devotion to our clients and high quality standards has helped Infogenix grow into one of the best web design companies in Utah. We've expanded our once small company to include complex programming for websites and applications such as photo galleries, ecommerce systems, and custom content organization, responsive tablet and mobile ready websites, proven search engine optimization techniques, and beautiful logo and graphic design. We've also created our own content management system that makes updating websites simple and easy to manage, even for the least tech saavy clients. Infogenix owners Ryan Camomile and Ryan Romero head our highly skilled and experienced teams of programmers, web designers, and SEO analysts. We produce the best web design, programming, and search engine optimization and we're fully committed to offering it to every one of our clients. Because Infogenix is more than just a business to us! Nineteen years of experience and the bragging rights that come with it. Ever growing staff of 20+ nerdy (but talented!) people. Spacious office building located in the Riverwoods. Fun and creative atmosphere that builds friendships and an enjoyable work environment. Tight-knit departments dedicated to excellence in our respective fields (design, programming, SEO, marketing, etc). We examine various aspects of business and web design with unique, in-house written articles that target our current clients to help them get more out of their online experience. We love talented and driven web designers, programmers, internet marketers, and sales people. 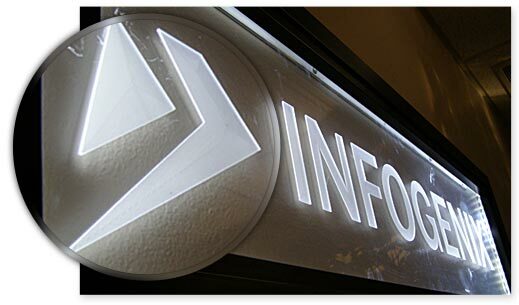 If you are seeking a career at Infogenix, we're delighted to provide job listings and contact info. Websites can be complex. We strive to make things simple for our clients and the sitemap helps you nagivate through the layout and pages of our site so you don't miss anything.